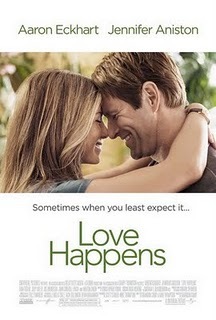 I have seen Love Happens before. Not literally, but it's one of those films where the story and characters are so familiar that you'll swear somebody pulled the old bait and switch on you and swapped the reel with one of the hundreds of other romantic comedies similar to it. It's nothing more than a routine stock picture that attempts nothing new and falls back on every rom-com tradition you can possibly think of. Much like Kanye West's behavior at an awards show, the movie is predictable, down to the letter, but unlike Kanye West, you still end up liking Love Happens. It's charm is inescapable. Aaron Eckhart plays Burke, a self help guru and author of the book, "A-Okay," a tool to help those who have lost a loved one reclaim their life and move on. When we meet him, he is on a tour promoting the book, stopping in various cities throughout the nation and his latest stop has placed him in Seattle for a few days, hosting seminars and working as a life coach to a number of people who have come to employ his methods of letting go. What they don't know is that he leads a double life, pretending to be happy and teaching others to be happy while dealing with his crushing depression left over by the loss of his wife who died in a car accident three years ago. Though he has a number of steps that teach his readers to move on, he can't follow them himself, hiding his own demons away and putting on a fake façade for his adoring crowds. Meanwhile, Eloise, played by Jennifer Aniston, has found out that her wanna-be rock star boyfriend has once again cheated on her and she is leaving him for good. The two meet and although Eloise blows Burke off initially, they eventually come to like each other, but the issue of Burke's depression hinders their relationship. The problem with Love Happens is that it is incredibly derivative of other romance movies. The story of a spouse dying and the widower having to get over it while finding love in other places is conventional. The many twists and turns it takes are cliché. It even sports some horrible lines of dialogue that are supposed to be touching, but come off as just plain stupid. No, this is not a particularly well written movie. But Eckhart and Aniston are very likable and work well together, not entirely negating the film's sameness, but elevating it above the drudgery we've become accustomed to in the genre. Personally, I found Burke to be an interesting character, however common he may be. Though he does put on a guise to hide his emotional pain, you do feel like he really does care about these people. He knows what it feels like to lose someone you love and doesn't want anyone else to have to share that pain. Some may find his ways contradictory ("Hypocrite!" his father-in-law yells at him at one of his speeches), but he doesn't do it purposely. In fact, he does it with good intentions, but just can't follow his own rules, telling his followers that alcohol is not a means to an end and will not help you get rid of your sorrows, yet he drinks constantly, usually in secret, for the very purpose he pretends to oppose. His character, spearheaded by the terrific Eckhart is the heart and soul of this movie, but the script ignores him far too often and goes on needless tangents, like an uninteresting side plot involving one of Burke's conference attendees who has lost his child. Yes, the loss of a child is sad and any human being with a soul will feel bad for this man, but his story is more schmaltzy than the already overly dramatic love story, which you've really got to try hard to do. The most heartfelt moment in all of Love Happens is offset by an unintentionally funny slow clap which, at least for me, has forever been ruined by Not Another Teen Movie, which hilariously spoofed this tired emotional ploy. This is only one example of the many tried and true formulas the film uses that come off as strikingly dull. Actually, most moments meant to be serious are noticeably scripted and work only on the most basic levels. I understood the hardships the characters had gone through, but I didn't really care. That was its main problem, but once again, the talents of the two stars shine through and their charming personalities push this one to its conclusion. Love Happens is nothing special (and with such a generic title, it's not much of a surprise), but I think there's enough here for a look-see.